Homemade truffles? Yes, why not? They’re actually quite easy to prepare and the result, melt-in-your-mouth deliciousness, is even better when you know they’re healthier than commercial truffles. Chop the chocolate into small pieces. Add it to a microwave-safe bowl and heat it in the microwave on low in 15-second pulses. Do not let it get too hot, or it will seize. If it does seize, add a little yogurt and try again. 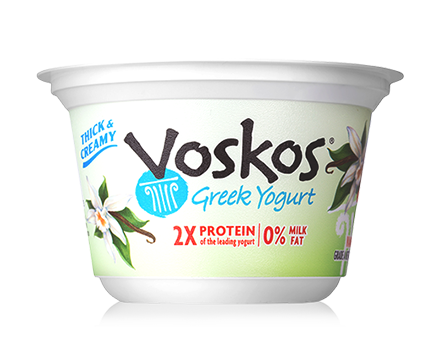 Stir VOSKOS Greek Yogurt into the melted white chocolate. Chill the mixture in the freezer for 2 hours. Before proceeding, chop the strawberries into bite-size pieces. Working quickly, scoop teaspoon-size balls of the white chocolate mixture. Roll it in your hands briefly to form a ball. 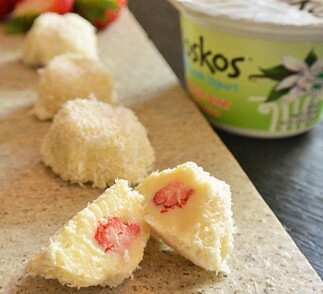 Insert a piece of strawberry, and use extra white chocolate mixture to seal in the strawberry. Roll the truffles in shredded coconut. Chill the truffles in freezer overnight.